"Iowa Cycles with Wright Hall in background photo by Sam Castro"
An image of the sculpture Iowa Cycles on the campus of the University of Northern Iowa in Cedar Falls, Iowa. 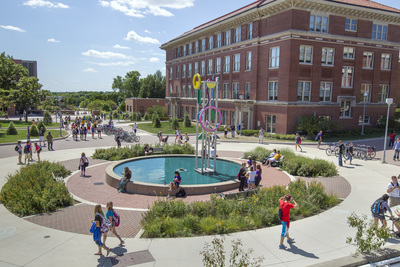 The sculpture by Cork Marcheschi was installed Union Plaza between Rod Library, Wright Hall, Sabin Hall, and Maucker Union in 1994 and is an Iowa Art in State Buildings Project commission. The medium is aluminum and neon. "Iowa Cycles with Wright Hall in background photo by Sam Castro" (2019). Art on Campus Photographs. 59.